Convert your DVD videos to most of the popular video and audio formats to playback on your PC or any portable device. The Windows Media Video (WMV) format was created by Microsoft. It produces small files with good video and audio quality. Windows Media files use proprietary Microsoft compressors. The AVI (Audio/Video Interleave) file format produces high image and audio quality and is an excellent choice if the video is edited later. It is a good choice for backing up DVDs. AVI files tend to be larger than other formats, so this may not be the suitable for portable devices with limited storage. Xvid is an implementation of the MPEG 4 video compression system, which is now widely used and produces very good video quality and small file sizes. 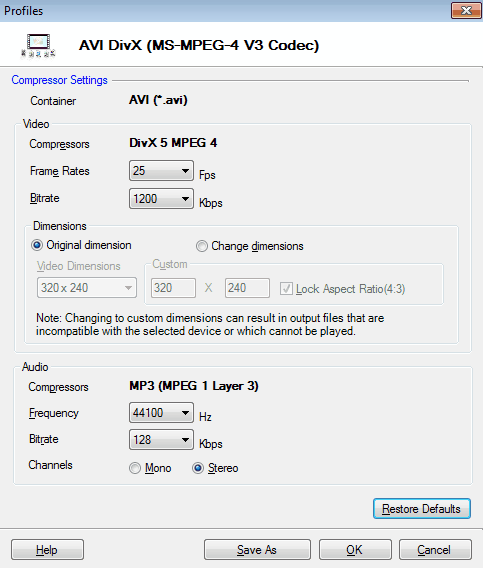 DivX is another implementation of the MPEG 4 compression method for video. It produces excellent video quality with small file sizes. AVI files created by Rip DVD Plus use MP3 audio compression. This is the most commonly-used and best-supported audio compression system, and should work on almost any PC. MP4 (MPEG 4) files are generally smaller than AVI files and have the same video and audio quality. The Simple profile produces larger files than the Advanced Video Codec. The Simple profile requires less computer resources both to create files during ripping and for playback, and is more suitable for older and slower PCs as well as some devices which do not support the Advanced Compression system. The default settings produce high quality video and audio. If you choose, you can change the settings by clicking on Customize. MPEG 4 files use the Advanced Audio Codec. This lets audio take up less space without losing quality and helps produce very small files. The QuickTime format was created by Apple Computer. QuickTime files have excellent file sizes and quality. You may need to install the QuickTime Player or other software to play QuickTime movies. MOV files created by Rip DVD Plus use the MPEG 4 Simple video compressor and the Advanced Audio Codec for sound compression. Default values may be different. For instance, the default bitrate varies depending on which output profile you have selected. We have selected defaults for every profile that produces very good quality video with the smallest possible file sizes. All AVI Xvid rips use the MP3 (MPEG 1 Layer 3) audio compressor. This is the most widely supported compression method and plays on almost any computer. 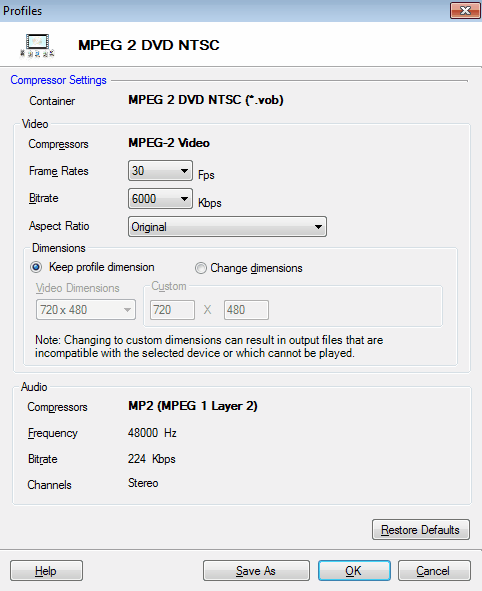 DVD files are saved using MPEG 2 video compression, with MPEG 1 layer 2 (MP2) audio compression. MPEG 2 files are given the extension .VOB when intended for use on a DVD. There are two major standards for DVDs which are used in different countries. The United States and Japan use NTSC (National Television Standards Committee) format and PAL (Phase Alternating Line) format is used by European countries and China. Most DVD players play discs made using the standard for their own country. Select the correct DVD format for the country of your audience. The frame rate is automatically set. This is part of the NTSC and PAL standards and cannot be changed.